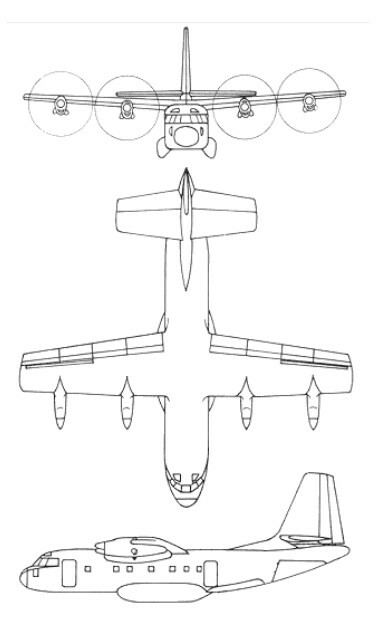 A Breguet designed four-engined STOL transport that would be suitable for civil or military use the Bre.941 relied upon the deflected-slipstream technique to generate additional lift. The four engines were mounted in nacelles at the wing leading edges so that slipstream from the propellers was distributed over the entire span of the wing. Full-span double-slotted trailing edge flaps were provided, these also being within the slipstream when deployed to maximise their effect, and with no wing trailing edge available for ailerons to be installed for roll control, four hinged spoilers were provided on the upper surface of each wing. The French air ministry ordered a prototype on 22 February 1960. It was of cantilever high-wing configuration, with an upswept rear fuselage to incorporate a rear loading ramp. Undercarriage was retractable tricycle landing gear that incorporated twin nosewheels, with tandem-wheel main units that retracted into fairings on each side of the fuselage. Powerplant was four 895kW Turbomeca Turmo HID turboprops, and the prototype was flown for the first time on 1 June 1961. Subsequent testing of the prototype resulted in Breguet receiving a contract from the French government for the supply of four production transports under the designation Breguet 941S. Production aircraft were fitted with more powerful Turbomeca Turmo engines, a longer nose to permit the installation of a large radome, and modification of the rear cargo door to allow for the airdrop of heavy loads. Operated by a crew of two, these aircraft could carry up to 57 civil passengers, or 40 fully-equipped troops, or 24 stretchers. The first of the production Br.941S aircraft made its initial flight on 19 April 1967, and testing proved that with an all-up weight of 22000kg, which was in excess of an assault mission take-off weight, the Br.941S could become airborne in only 185m. All four of the production aircraft entered service with the Armee de I'Air, but no additional examples were built. There had been hopes that, with assistance from the McDonnell Aircraft Corporation, orders might be generated in the USA, but despite a demonstration tour in America, no production orders were received.